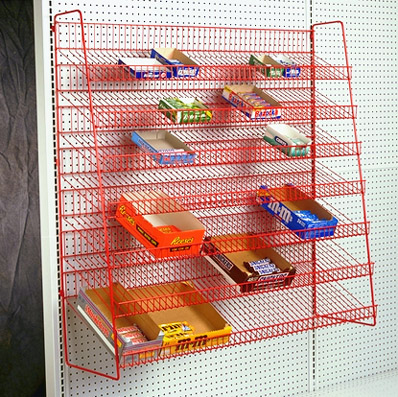 The Wire Candy Rack for Gondola or Wall mount shelving is used to display small boxes of candy, cookies and other snack items. Attached brackets allow for easy installation in the Gondola/Wall Uprights. It may be used on either a Base or Upper Shelf. The unit is 24” tall, 8” deep with three shelves top to bottom 4", 5", and 6", respectively. It is available in 36” or 48” widths with 1” OC wire spacing. 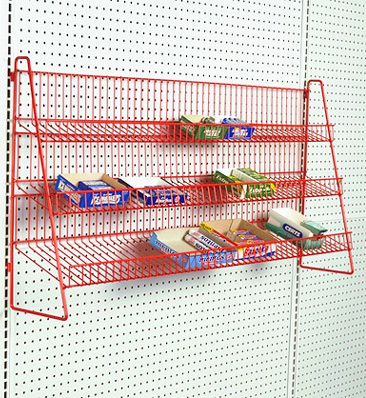 The Wire Candy Rack for Gondola/Wall shelving is used to display small boxes of packaged candy, cookies and snacks. Designed to be used on the Base Shelf of Gondola/Wall shelving. The unit is 48” tall and 13 ½” deep. It is available in 36” or 48” widths with 1” OC wire spacing. 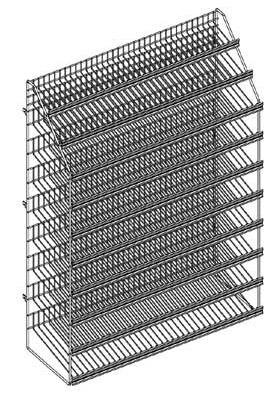 The Ten Level Wire Candy Rack for Gondola ships as one piece providing quick installation into any Madix Gondola/Wall Upright. Each individual pocket has a 13 degree slant from the back to the front of the unit. Load capacity is 250 lbs. This slant provides a natural gravity feed to bring merchandise in front of the customer. Every wire candy pocket has a 11/4" metal tag mold and 1" o.c. wire spacing.